Stay on a boat for a unique America’s Cup experience combining luxury accommodation, the world’s best sailors and the fastest boats. The America’s Cup World Series event in Portsmouth promises to be a spectacle not to be missed. Find out about the history of the event, useful information, how to win tickets and an alternative way to stay. The America’s Cup is the premier sporting event in the sport of sailing and the oldest trophy in world sport. For 164 years, the America’s Cup has become one of sport’s most revered trophies with challenges characterised famously by some of the most thrilling dramas – and bitter rivalries – in sporting history. The incredible fact is the event started in the UK and Great Britain has yet to win it. So what better time to stay on a boat for a unique America’s Cup experience? The best sailors, the fastest boats! The Racing in Portsmouth is an edge of your seat and adrenaline fuelled spectacle which sees the world’s best sailors racing on foiling, wing-sailed catamarans that ‘fly’ on foils at astonishing speeds of up to 40mph and just metres away from the spectators on shore… #sailingtakesflight! Every race will count with vital points being secured ahead of the America’s Cup Qualifiers in Bermuda come 2017. The Portsmouth event takes 21-14 July 2016. With the racing taking place at almost touching distance from the onshore spectators and cannot fail to be spectacular, thanks to the big screens, family entertainment and a regatta village all happening in Southsea, Portsmouth. Super Sunday counts for more! Each race on Saturday counts for 10 points to the winner, 9 points for second etc. Each race on Sunday counts for 20 points to the winner and 18 points for second etc making ‘Super Sunday’ the prime day for team results. FREE TICKETS – We are giving away tickets to the ‘Super Sunday’ of the Louis Vuitton America’s Cup World Series on July 24th 2016. To get your tickets, book a stay on a beds on board boat and we will include free Race Village entry tickets worth £27.50 each. Start your search on our America’s Cup page today. America’s Cup Portsmouth, Where to Stay? 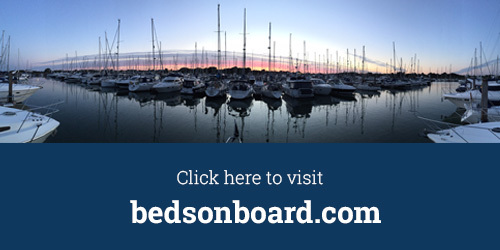 NEWS: On Feb 25th 2016 Beds on Board are announced as official supplier of on-water accommodation for The Louis Vuitton America’s Cup World Series Portsmouth. So stay on a boat for a unique America’s Cup experience! A first of its kind, the partnership defines a new category of accommodation that allows spectators to stay on board private yachts moored in marinas around the event. The partnership creates a unique experience for spectators and increases the available accommodation for the event which starts on Thursday July 21st in Portsmouth. Book now as this will be the last time fans can support the Portsmouth based Land Rover BAR in the UK ahead of the Bermuda 2017 America’s Cup – an opportunity not to be missed. Search our Portsmouth listings page.